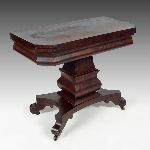 3 EARLY 19TH C PARQUETRY INLAY WRITING TABLE: Inlay in a tumbling block cubic illusion pattern, single drawer, long tapered legs. 29 1/2'' h x 43 1/2'' x 21'' deep. 10 BARRIAS, Louis-Ernest, (French, 1841-1945): ''Nature Revealing Herself Before Science'', Gilded Bronze and Marble, 23'' h., signed, impressed Susse foundry marks, sold with custom revolving top pedestal with glass encasement, 42'' h., 70 1/2'' total. 14 RUSSIAN ICON OF CHRIST PANTOKRATOR: 8 3/4'' x 7'', Hallmarked 1882, Russian silver assayers mark on oklad, possibly Alexander Muhkin. 15 RUSSIAN ICON OF THE KAZAN MOTHER OF GOD 1894: 7'' x 5 3/4'', hallmarked assayers and makers mark, embossed relief design with hand chasing. 18 JARDINES, Jose Maria, (Spanish, 1862-): ''After the Bullfight'', depicts a young matador with his lady after a victory, OIL/Panel, 16'' x 12 5/8'', signed, framed, 19 1/2'' x 16 1/2''. 20 A PETITE 19th C DRESSING TABLE: Inlay, matchbook veneer lift top table with interior having a beveled mirror over the compartments. Turned legs joined by lower shelf. 29'' h. x 2 1/2'' x 15''. 22 19TH C. OIL/CANVAS OF CHRIST AND THE WOMAN OF SAMARIA AFTER FONTANA: 39'' x 29'', faint signature verso on original canvas, gilded gesso frame with wear, 49'' x 39''. 31 TECO POTTERY VASE DEIGNED BY ORLANDO GIANNINI: Impressed with 167 and the Teco trademark. Green matte glaze. Drilled as for a lamp. 16 1/2'' tall, 11'' dia. 32 ROOKWOOD FRED ROTHENBUSCH VELLUM GLAZE SCENIC VASE: 14'' tall, shape 2651, dated 1925, impressed with the artists symbol. Well painted scenic landscape in darker hues. 34 LATE VICTORIAN / ARTS & CRAFTS DROP FRONT DESK: Very unusual heavy brass hinges act as the support for the drop front. Fitted interior, one exterior drawer. Long shaped legs joined by bottom support shelf. Brass gallery on the top. 41'' tall x 27 1/2'' x 17''. 36 19TH C DUTCH MARQUETRY SIDE CHAIR: With shaped and pierced splat back, serpentine seat, cabriole front legs. 44'' tall x 22'' x 21''. 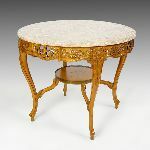 37 DUTCH PARQUETRY TILT TOP OVAL SIDE TABLE: Overall finely detailed inlay, on top, sides, turned support and the tripod legs. 22 1/2'' tall x 14'' x 23 1/4''. 40 MATTENHEIMER, Andreas Theodor The Younger, (German, 1787-1856): Portrait of an Austro-Hungarian Officer, OIL/Canvas, 29'' x 24'', signed and dated 1825, gilded gesso frame with wear and overpaint, 37'' x 32''. 47 NEOGRADY, Laszlo, (Hungarian, 1896-1962): Landscape with cattle drinking at a river, OIL/Canvas, 15 3/4'' x 20'', signed, overpainted frame, 24'' x 27''. 48 10 FOOT MARBLE & WOOD CONFERENCE TABLE: Splits into 2 sections, each with a separate pedestal for versatility of use. Flame wood interior with marble trim. Measures 30 1/4'' h, each table 60'' x 48'' making 120'' of work space available. 49 DAVIES SOLE CRYSTAL PALACE DOMED MANTLE CLOCK: Brass and wood construction under original glass Dome. Original paper label ''The Crystal Palace Clock'' Davies & Sole Man'f Patented Jany 26 1875''. Also burned Davies in wood base and marked Davies on pendulum. E. N. Welch movement with faux mercury pendulum. All original. Overall 17 3/8'' h. x 8 1/2''.